Please join me for a pre-holiday pop-up hosted at The Dahlmer Household on Sunday, Nov 18th, 5:30-7:30pm. Guests will have a chance to stock up on my greeting cards before the holidays & before any other fall/winter events I am participating in. There will be light refreshments available. ONE NIGHT ONLY: mark your calendars, November 28th is just 11 days away. Here is the latest roster poster for the 1st Thanksgiving Break POP UP fair at the HIVE, Gloucester’s amazing downtown arts center. Can’t wait to see what these young local artists do! Love the local all that day. Saturday, November 28th, is ‘Small Business Saturday’ – marketing, yes, but as opposed to Black Friday and Cyber Monday, why not? Support our businesses. SHOP SMALL downtown, stop by the Hive to see and shop more from 4-8, and then head out to eat or restaurant hop. 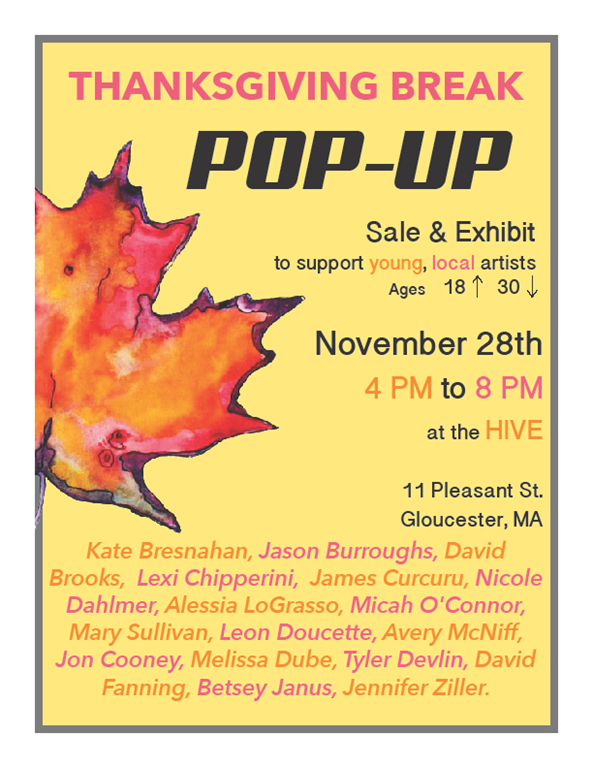 The Hive is hosting Gloucester’s Young Artist Pop-Up Show on November 28th. Check out the artist directory below. 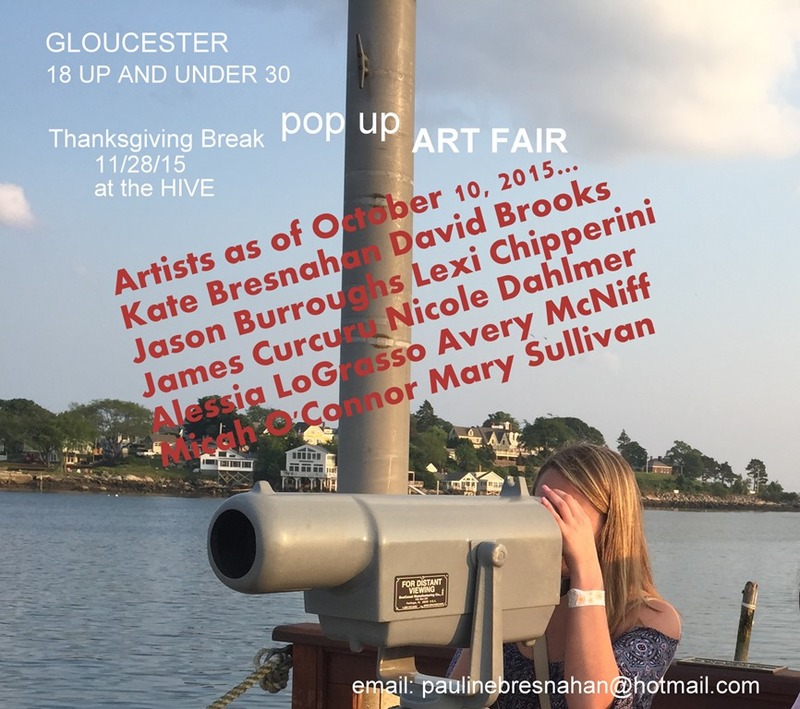 Since the first announcement, we now have 10 younger Gloucester artists signed up for the inaugural Thanksgiving Break POP UP ART FAIR on November 28, 2015 at the Hive from 4-8pm. So far that’s representation from GHS alumni years 2006, 2007, 2011, 2012, and 2015. Pretty good so far! We hope more artists will sign up and can’t wait to see what they do. Spread the word! Contact Pauline at paulinebresnahan@hotmail.com to add your name to the growing list of exhibitors. We are looking for artists working with any media and/or creative service. Writers, musicians, documentarians, performers, printmakers—who is out there? Friends and family: please share the fair and save the date. And thanks Joey for the first post—it truly helped to get the news out and encourage sign ups.